A few months after we moved to Decatur a new restaurant opened in town. The Blueberry Pig was our ‘go-to’ place for a year or more. That was until the quality, along with other things, changed. That’s why we were very excited a few weeks ago to see a sign indicating that the ‘Pig’ was closed and a new restaurant was going to open. Yes, the Pig made its exit and Rocky Top Café entered. Although it had only been ‘in business’ a few days we decided to take our chances the same week they opened. It turns out that the new owners are former employees of the Pig. They jumped at the opportunity to buy the business. We had a nice chat with the owner while perusing the new menu. The restaurant itself looks pretty much the same, except neater and cleaner! The menu does contain some local favorites such as ribs, pulled pork and brisket. They have added more entrees including sirloin steak, rib eye steak, pasta dishes and even grilled shrimp. Since I’m a steak person I went with the 9 ounces sirloin for $11.99 which comes with two sides. I had a baked potato and grilled mixed veggies. My husband ordered the brisket dinner for $9.99 and his sides were fries and baked beans. Obviously steak is prepared when ordered, so it did take quite a while for our meals to arrive. We did give them the benefit of the doubt since they are new. My sirloin steak, ordered medium-well, was well done. I requested no seasonings and they got that part right. The steak was fairly tender, but would have been more so if it had been cooked properly. The potato was hot and the butter melted (fake butter) easily. The grilled mixed veggies could have been a little less cooked. My husband wound up with a huge platter of smoked brisket, which he said was very good. They give you way too many fries, a half-portion would be plenty. He enjoyed his food, as was evidenced by empty plates except for 1/2 the fries! The owner asked how everything was and I mentioned the steak. Her husband is the cook, she said she would tell him. So the bottom-line, considering they were just a few days old – they have good potential and I think with a little more time they will just get better. I did notice someone dropped in just to order a piece of hot-fudge cake to go….now I wish I had ordered a slice – next time I will. 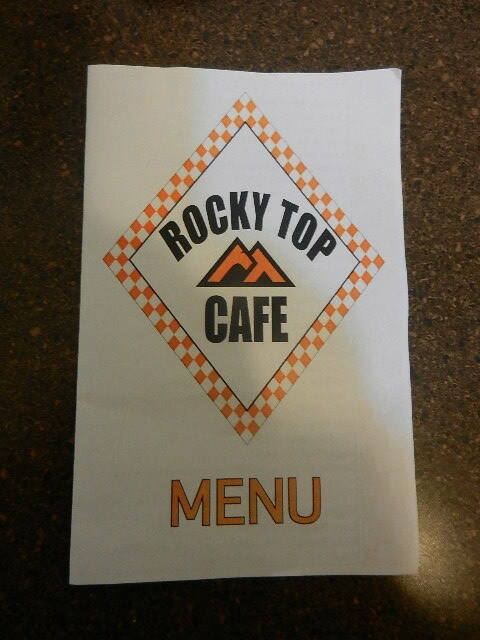 The Rocky Top Café is in Decatur on Highway 58 so if you are in my neck of the woods and find yourself hungry, stop in give them a try. Sides: Veggie blend, corn, pinto beans, fries, mashed potatoes, etc.